In the better Web based safety management software programs, all users are engaged in the safety process. They are reporting issues, managing assigned tasks, corrective actions and cognizant of the airline or airport's safety goals and objectives. When users come to an enterprise level program, they need a jumping off place, i.e., a place to call home where they can see all activities assigned to them. Users will also need a central place to find information on safety manager(s), company goals and objectives and the CEO commitment to safety. What are Safety Workspace Tools in SMS Pro? Most users come to the Safety Workspace to follow up on their reported issues. They can see a list of their reported aviation accidents, incidents and hazards. This is why SMS Pro doesn't call the hazard reporting tools a "Hazard Reporter," but an "Issue Reporter." The Issue Reporter can be customized to handle all the concerns listed above. Safety Workspace allows users to review their reported issues and follow up on these reported hazards and incidents. Department Heads are assigned reported aviation hazards and incidents by safety managers. Department heads can see their assigned issues and quickly navigate to these issues to manage. Corrective preventive actions (also called CPAs, corrective actions preventive actions, CAPA) can be assigned to any employee in a department heads division. These CPAs are assigned to users by department heads. When users have completed their corrective actions, they can come to Safety Workspace to document their activities and notify the responsible manager that the corrective action has been completed and is ready for review. Every employee has job duties based on the position they were hired to performed. Employees may also require specialized training and qualifications. Safety Workspace has a section called "Training" where users can see their required training and qualifications, and easily see whether these training and qualification elements are current. Safety Workspace helps engage users in your safety program. They can see their activities and follow up without requiring additional resources from the safety team. 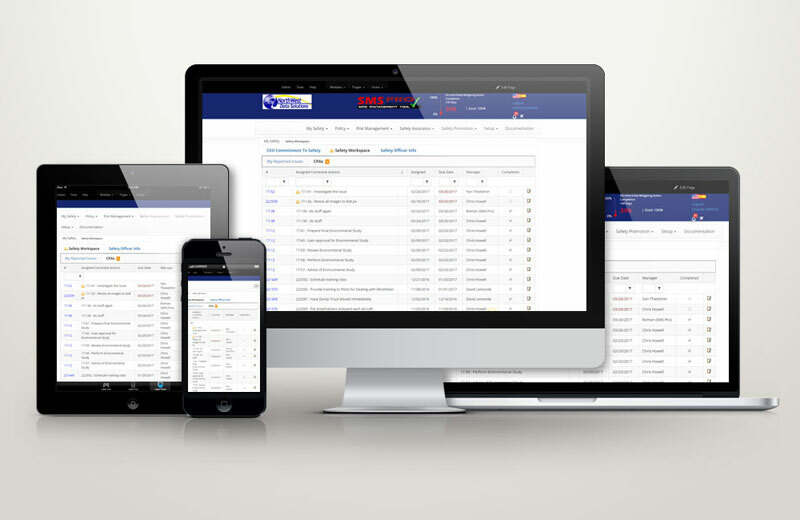 Safety Workspace also allows users to document their corrective actions, thereby keeping all safety related documentation within the system without requiring additional safety team resources. Users also can regularly see evidence of top management's commitment to safety. Safety Workspace allows all users to use the safety tools. Who Uses the Safety Workspace? Every user in the organization can benefit from using Safety Workspace, but not every user is expected to visit daily. For example, top executives can visit the Safety Workspace to review the real time charts, such as number of reports, percentage of users using the system, etc. Regular SMS Users review their reported issues and communicate to management that their corrective actions have been completed. All documentation stays in the system. How are Items In Safety Workspace Managed? Safety Workspace has links from lists of reported issues to Issue Manager. Safety Workspace elements are based on items coming due in sortable and often filterable lists. For corrective preventive actions, a popup window appears with each element for users to document their actions that are then forwarded to the respective responsible manager.